"What have I been doing with my time? Working...a lot..."
Or, as somebody else once said, "Makin' a livin's 'bout all I got time for." You're not dead yet, della! C'mon start work on that bucket list!! I'm planning to go to Tibet myself in 2012!! Dunno. I might make it to some exotic locale as well someday. Well, I am going to Italy this fall, and then was going to save up for a downpayment to my own place. However, today I just dropped over $600 for plumbing repairs to my mom's house. And that has done a lot to knock the shine off the idea that owning my own home would be a dream come true. I was watching the DVD of "A Study in Pink" last night with the commentary on, and the producers remarked how totally unlike their characters the two actors are. They mentioned how Benedict is more 'bumbling' than his TV character, sweet and nicest guy you'd want to meet, yet - like Sherlock though in a nicer way - gently asserts himself in a room as the alpha male. I wish I could find this article I read a few days ago. Benedict talked about his life in detail, things he'd done, places he'd been, life-risking things that he wanted to experience (he mentioned skydiving and had a video made of him doing it and said he enjoyed watching his 'double chins flapping') and he actually went to Tibet to teach English for a couple of years. Atonement on tap for tonight!! We may just have to change the name of this thread to "Benedict, Benedict, Benedict!!!" Well, it might as well be until he makes next year's episodes! Or until Martin Freeman becomes a Hobbit. And also, the man keeps busy. He's got two more movies due out this year. His voice has been compared to Alan Rickman and on the DVD for Episode 3, he even supposedly does an Alan Rickman impression. I'm in the middle of his mini-series "To the Ends of the Earth"
and am taking a break tonight to watch the DVD commentary on Sherlock Ep 3. His voice has been compared to Alan Rickman and on the DVD for Episode 3, he even supposedly does an Alan Rickman impression. Yeah, he does sound like Alan Rickman. I'd like to hear his impression. I'm going to see Alan Rickman on the 29th in Ibsen's "John Gabriel Borkman" with Fiona Shaw and Lindsey Duncan. True, he has the same accent but AR's voice is more nasal. I wonder if he has to put a clothespin on his nose to do the impression! Meryl, we envy you so much I'm turning green! Please give us a report!! Benedict does do an AR impersonation. It is quite good. And strangely, Martin Freeman did not sound very enthused doing the DVD commentary. He was silent for the most part and just came across with a 'I don't really want to be here' attitude. Benedict was much more generous with his time and, after he warmed to the situation (the two actors hadn't seen the episode and apologized for their moments of silence because they were watching it), became quite talkative and - as the directors described earlier - gently assumed the mantle of the alpha male of the room . Benedict did say he and Martin were completely different actors. As he put it, not quite "chalk and cheese". Who knows? Perhaps Martin is one of those Sean "I stay in character" Penn method actors or Robert "I can't put two words together without a script" DeNiro actors. 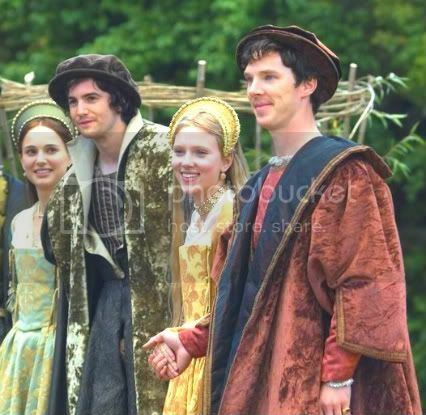 Thumbs up on Benedict's performance in The Other Boleyn Girl. His part is small, but very poignant. Some of the best scenes are his and they're cut from the movie. You can see them in the Deleted Scenes section of the DVD. SOME SPOILERS if you haven't seen the movie. He plays Mary Boleyn's husband, newly married and they're innocent and very happily wed, just to have the king visit and take a shine to Mary ordering her to the court along with her husband. Since these are 'royal appointments' and the Boleyn men are ruthlessly ambitious, they railroad Benedict's character into accepting the position with him knowing full well what's going to happen. And he's heartbroken about it. Now the Mary character goes the palace and flattered by the king's attention and lust, decides she's in love with the king and forgets about her husband and doesn't care when the king sends him away from court on an assignment, laughing about her inability to tell the king what to do. Then in the deleted scene, when Mary returns home to her husband with her illegitimate child, she finds out that while she's been involved in a torrid lust affair and fighting with her sister over the king, her husband has been consumed with guilt, still in love with her. Benedict's acting is amazingly sincere and I tell you I was crying at that scene. I wish they'd put that scene in the movie. It gave real heart to the movie that isn't there otherwise, showing the emotional cost of having an affair and made quite clear that Mary herself is not an innocent victim anymore. She's just as callous and cruel in love as anyone at the Court.